Verizon notified media this morning that they will hold a press event tomorrow to discuss the rollout and launching of their 4G LTE service before the end of 2010. We were tipped to a December 6th go live date originally, but now have further confirmation from additional sources that it’ll be either on the 5th or the 6th. 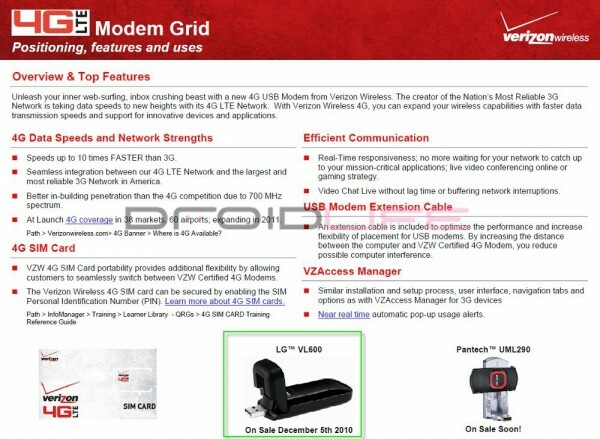 And as you’ll see from the document above, 4G LTE modems will start going on-sale in stores on the 5th. Now if only that page could have also displayed the Incredible HD, life would have been really good.